The use of stone tools is something that separated our ancestors from the chimps. Until now that is! 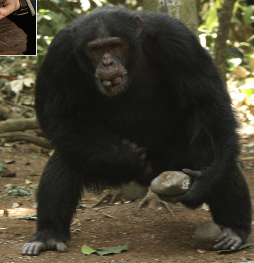 Kanzi is a chimp that’s been trained for years to make stone tools. Check out this amazing video of him creating a stone tool to solve a puzzle. Keep an eye out for some bipedalism in this video too (and a bit of banana eating, because no primate video would be complete without that)! As impressive as that was Kanzi still isn’t as good as our ancestors were at making stone tools; despite years of training. Even our early Australopith ancestors – who were very chimp like – were better than he is. This is because Kanzi has a relatively short thumb and immobile wrist (both adaptations for knuckle walking). This prevents him from using the same precision grip as our ancestors (and us), making it difficult for him to control his blows and produce a high quality tool. Luckily for us it would seem the chimp revolution is still a little way off. But when they do take over, don’t say you didn’t see it coming. Next post: Answers in Genesis claim new Australopithecus fossil is human! If he was trained, does that really count ? It seems that the idea that only hominids made/make tools is quite crucial. Not really, our lineage remains the only one to manufacture stone tools in the wild. However, I think this research is really interesting because it shows that it’s chimps’ anatomy, rather than cognition, that stops them from making these tools. Kanzi understands what’s going on, he just physically can’t do it. What about the other way around. Lets get some amputees swinging through the trees with chimp hands. Sorry I meant only the homo + australopithecines. I always get confused on the meaning of hominids. Great video and post. I enjoy them as usual. There is a “make a fire” argument for separating Homo, or Hominins, anyway, some group that includes us, from the rest of the apes. There are chimpanzees who smoke cigaretts. Does anyone know if they light their own fags, or does a human have to do it for them? so they must maintain a culture of constant smoking? Poor chimps. I wonder if a chimp could strike a match. I would doubt they could use a conventional cigarette lighter. My next door neighbor does beautiful flint knapping. I, being untrained, doubt that I could do it. But with a few minutes of practice you could easily beat Kanzi. That’s something to hold on to! Hominid stone tool makers were trained too. Presumably some got better than their trainers and others didn’t pass the exam. Tool making is too complex to make up by just banging rocks together. There’s a culture of rock selection, blow types and so on. Plus knowing when to ditch and move on to the next piece. On my limited reading, not everyone makes tools and proficiency is recognised. Apart from their anatomical deficiencies and I guess weaker cognitive capacity for the technical aspects of rock selection, design and construction, chimps don’t have the mental machinery for cultural side of teaching and maintaining the art. Kanzi was not taught by other chimps. Kanzi can pick out the right materials needed, but identifying whether he knows how to hit it is difficult, given his behaviour is consistent with both lack of understanding and lack of anatomy (at least one of which we know he lacks for sure). The social aspect is something I hadn’t really considered. There’s a lot of debate around whether chimps “teach.” On the one hand, experiments have show chimps will learn a behaviour from others under experimental conditions, but there are few, if any, examples of innovation and adoption by the group in the wild. Kanzi is really one of the most human-like chimps I’ve seen. He even smokes! Kind of evil to give a chimp a cigarette. Kanzi is not doing well, being overweight and showing some signs of psychological trauma from captivity. Maybe smoking cheers him up?